Set sail over the Napa Valley (approx 1 hour) then indulge in an after-flight champagne brunch at the “Michelin Awarded C Casa at Oxbow Public Market”. Balloon rides over Napa? Oh yes! 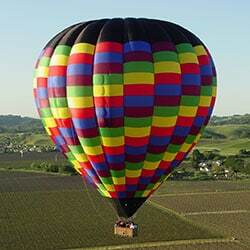 Thinking balloon rides over Napa? Experience the thrill of a lifetime when you take off on a breathtaking hot air balloon flight high above the Napa Valley. Enjoy balloon rides Napa style by soaring above the landscape, you’ll be inspired by the incredible views below and be filled with a sense of awe and serenity. Our flight + brunch package offers round-trip transportation from your hotel in the Napa or Sonoma area and begins with pre- flight coffee and pastries. For those that wish to take their own vehicle, you are free to meet us at Model Bakery located in the Oxbow Public Market. After arriving at our launch site, you’re invited to see the final stages of balloon inflation before joining your pilot. Once on board, it’s time for photos that are available for purchase during brunch. The approximate one-hour flight gives you a bird’s eye view of the beautiful Napa Valley and surrounding landscape below. Depending on wind conditions and visibility, you’ll see Mt. St. Helena to the north, the Mayacamas mountain range to the west, and you may even catch a glimpse of the San Francisco skyline. Once we’re safely back on the ground, you’ll enjoy an incredible champagne brunch on the patio of the award-winning C. Casa restaurant located at the Napa Oxbow Market, one of the area’s finest purveyors of artisan foods. A five-time recipient of Michelin’s Bib Gourmand award, C. Casa is the perfect place to sit back, relax, and reminisce about your flight. Bon Appetite! For balloon rides in Napa, you should plan on being with us for approximately 4 hours from start to finish (balloon rides + Napa brunch), and be prepared to continue your day with your newfound friends/basket neighbors!